Make a memorable first impression by curating a formal living room that's fresh and fabulous. With accent pieces like this sophisticated glam sofa table, you can't go wrong. This piece has an artsy edge with a vibrant pattern of intersecting metal in the base and a classically gorgeous marble top. 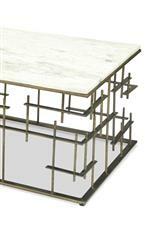 The Jacquin Contemporary Rectangular Marble Sofa Table with Metal Base by Riverside Furniture at AHFA in the area. Product availability may vary. Contact us for the most current availability on this product. 72417 Rect Console Table-Base 1 0" 0" 0"
72415 Rect Console Table-Top 1 48" 12" 30.5"
Give your living room scene a fresh, sophisticated revamp with this gorgeous group of marble-topped tables. The combination of the white marble and dynamic intersecting metal is a bold take on contemporary design that looks impeccably upscale. The intersecting metal bases are finished in an antiqued finish with gold and brass tones. It's a great way to incorporate a touch of glam without going too flashy or over-the-top. The Jacquin collection is a great option if you are looking for Glam Contemporary furniture in the area.